Enter the details you would like to appear on your certificate(s) below. Ordering multiple certificates will order duplicates of the same text. To order certificates with different information, please add them to the cart separately. Check your text carefully for spelling, punctuation, and capitalization. Text on certificate will appear exactly as typed. The certificate looks best with a two line tribute. Just hit your return button after the first line, or where you would like the line to break. Buy a star for as low as $28.95. Only $19.95 for a limited time! 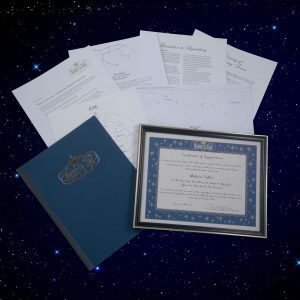 The beautifully detailed Print-it-yourself Star Certificate is suitable for framing and can be given as a memorial or for any other occasion for only $28.95$19.95 and comes with FREE INSTANT delivery to your email. Save the time and cost of shipping. 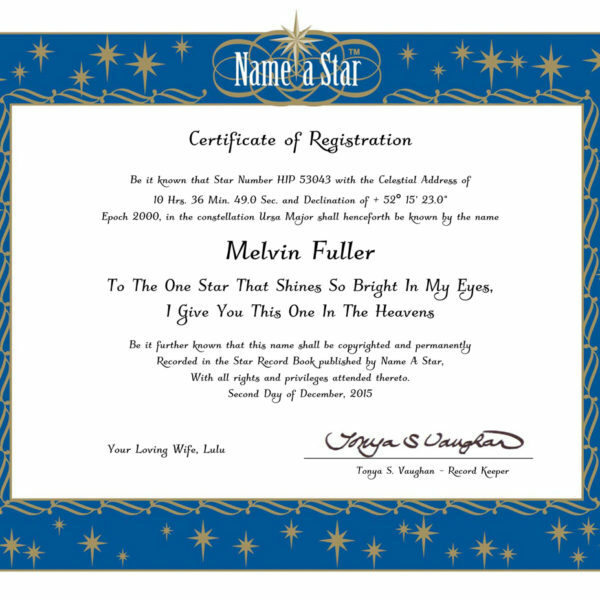 For only $28.95 $19.95, Name a Star will INSTANTLY deliver to your email a printable digital PDF file along with instructions to print this finely-detailed Certificate of Registration. The Instant email delivered Print-it-yourself PDF Certificate will be emailed as soon as you complete your order. You can print it, post it, and share it! Customize your star right now to honor that special friend or loved one. This is a print-it-yourself PDF file that includes ONLY the Name a Star™ Certificate of Registration. The quality of this product depends on your printer, ink and paper. PDF files are used throughout the print industry to preserve the integrity of printable documents – PDFs maintain their formatting so that they print the same way every time, regardless of your printer type or settings. If you do not have the resources or time to print this file yourself, forward the PDF file to the recipient directly or copy the file to CD or disk. Take the file to any print or copy service, where they will produce the Certificate using the ink and paper of your choice. Once printed, simply place the hard copy Certificate in a frame or presentation folder. It’s the perfect gift or award for any occasion! Remember to provide the actual e-mail address to which you want the Certificate of Registration sent. It’s best to use your OWN email address because all receipts and other order correspondence will also go to the email address provided. Then you can forward the PDF Certificate at the perfect time. This package does NOT include detailed astronomical star charts of your star’s location, though the PDF Certificate does show the star’s coordinates. 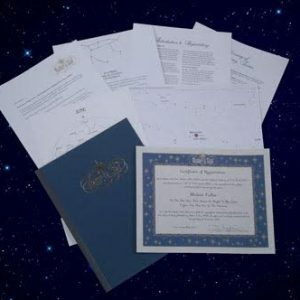 For the star charts, you must order the Custom or Deluxe Package. You need Adobe Acrobat Reader installed on your computer to view or print a Name a Star Instant Certificate. Adobe Acrobat Reader is available for FREE at www.adobe.com. NO REFUNDS available for Name a Star Instant Certificates! The certificate looks best with a two line tribute. Just hit your return button after the first line. A Portable Document Format (pdf) file is a self-contained cross-platform document. In plain language, it is a file that will look the same on the screen and in print, regardless of what kind of computer or printer someone is using and regardless of what software package was originally used to create it. Although they contain the complete formatting of the original document, including fonts and images, PDF files are highly compressed, allowing complex information to be downloaded efficiently. Once PDF reader software is properly installed, you just need to click on a link to a PDF file and it will be loaded for viewing on your computer, tablet or smartphone. Note that the file is sent to your computer as a temporary file that will be deleted when you exit your browser. Download Adobe Reader for free. We love Name a Star! We purchased the Deluxe Framed Star package as a gift and it proved to be the perfect gift for our friends! After 38 years of business, and great customer service you can see why they are the “go to” business to give you an incredible gift package! And by the way, our grandsons still love the Star Projection race cars they received and on their own, tuck them right into bed with them every night! Thanks for the wonderful review. We are happy to be sharing the joy of the night sky and helping children to sleep peacefully. Great gift for the person that has everything or as a tribute. Their customer service was excellent when I made a mistake on my order. Thank you!!! 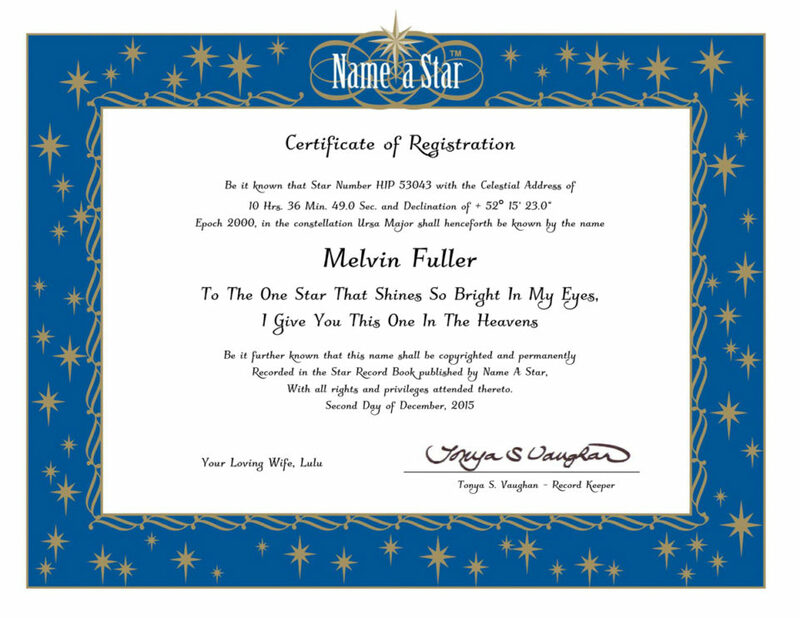 We are happy to know that we could help you put a meaningful tribute on your Name a Star certificate. It’s so perfect couldn’t be happier I know it’s gonna be the most precious gift our daughter gets this year. 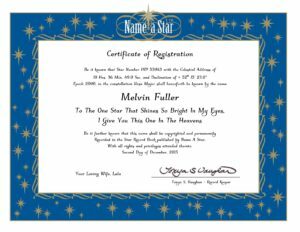 We named a star after my nephew who passed away at birth. It was a very emotional time and his parents were very touched by it. We can now look up at the sky and know his star is shining down on us. Not only did my certificate come in a matter of minutes, when I called and realized I made a clerical error (I put “my” instead of “our”), the customer service associate fixed the problem quickly and with a pleasant voice. I will order this gift again. We named a star in honor of my husband’s mother who recently passed away unexpectedly. The grandkids will be delighted to see this little surprise at her memorial life celebration nicely framed. Truly love Name A Star. I’m never disappointed and it’s such a beautiful way to commemorate our loved ones, that live in forever in our hearts and the heavens above. One of the most beautiful things I’ve ever seen. I couldn’t be happier. Perfect valentines day gift! Great service. I had an edit and within the hour a revised printable pdf was sent. Gift for my niece who is turning one! Definitely, a great idea to commemorate any occasion. A gift that keeps on giving and will be there for every birthday to come! Got what we wanted, the perfect birthday gift. The website isn’t quite as clear as I would like, but eventually managed to print the certificate. Great service.